The Marsh Foundation Schol Principal, Robbie Breese, stands between winter graduates, Xavier Puterbaugh (left) and Zildgian Galliher (right). VAN WERT — Zildjian Galliher and Xavier Puterbaugh, two Marsh Foundation School students, were recently honored for receiving their high school diplomas. Galliher now plans to enlist in the military, and Puterbaugh has returned to his home county and enrolled in an independent living program. The Marsh Foundation School in Van Wert is a not-for-profit children’s services agency that offers group homes, family foster care for ages 17 and younger, an intensive treatment program and adoption and independent living. The school also offers an on-campus school for grades 2–12. 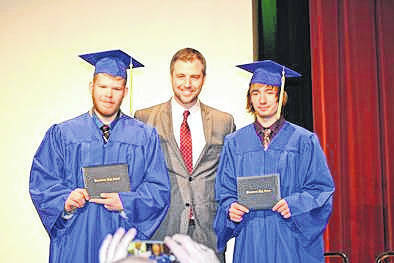 https://www.limaohio.com/wp-content/uploads/sites/54/2018/01/web1_wintergraduation.jpgThe Marsh Foundation Schol Principal, Robbie Breese, stands between winter graduates, Xavier Puterbaugh (left) and Zildgian Galliher (right).